Isn't money laundering essentially what Hilary did? She paid for the dossier of dirt on Trump, and washed it, (laundered it) thru her lawyer, Perkins Coi and Fusion GPS. This way she can hide her fingerprints that her money was used to pay Steele, who paid Russians working inside the Kremlin. All so she could dig up dirt on her presidential candidate opponent, and his campaign. Then, the information gets released to the FBI, to help get FISA warrants to spy on her political opponents. Money laundering generally refers to activities that are done to attempt to legitimize money that has been obtained from illegal activities. Paying for opposition research on a political candidate is not an illegal activity. The Russian mob's sources of income include plenty of illegal activities. (laundered it) thru her lawyer, Perkins Coi and Fusion GPS. 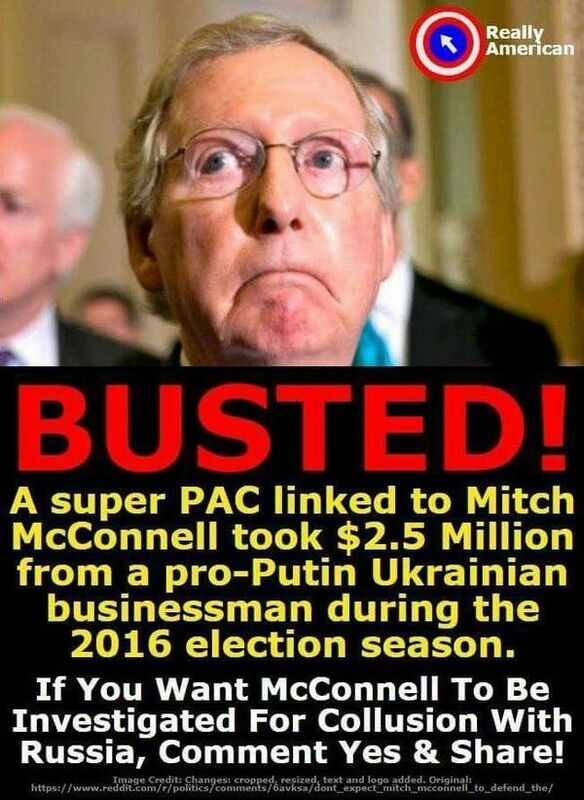 who paid Russians working inside the Kremlin. All so she could dig up dirt on her presidential candidate opponent, and his campaign. to help get FISA warrants to spy on her political opponents. WOW.....there's a whole lot of crackpot in that statement. You forgot to somehow implicate the 16 year old that Kavanaugh pinned to a bed and assaulted. I'm sure she's in on the whole thing too. Mueller will now probably wait until the mid-terms are out of the way before taking any more action. tRump owes the Russian mob and Putin big time, no doubt. And he's not the only Pub caught in that web. Plenty of tRump's bootlickers in the House have Russian dirt of their own that they're trying frantically to keep under the rug. This scandal has some deep roots. Maybe we should thank the ruskies for the great economy we hare having and thank them profusely for taking a hit on the chin for their failing economy compliments of Trump? what's worse money laundering or selling Russia 20% of our uranium supply, allowing putin to attack crimea and Obama response to the defenders was crates of food and blankets...he didn't want to annoy putin. Does money laundering rise to the level of defending putin as not our enemy, not crossing the redline because it would annoy putin, allowed putin to get a foothold in the middle east. who whispered sweet nothings in the Medvedev's ear to relay to putin? Whose foundation received tons of Russian cash for business favors by podesta and Hillary???? If trump did any of those things he should be prosecuted. He didn't Obama and Hillary did and so deserve your outrage. The NY Times makes up nonsense about Trump. Back to Russians again. When will you guys ever learn. They never will, they are automatons programmed to believe everything the MSM tells them and the NYT and others bank on that. I have posted this article before. I think this is a good place to bring it back up. It’s a no brainer. OF COURSE Two Scoops has been laundering money for Russian mobsters for at least a decade. And, the Russian mafia is a subsidiary of the Russian state. Organized crime bosses report to Putin. This needs to be investigated to the hilt and appropriate actions need to be taken to protect America from a malicious foreign power. Well hopefully Mr. Mueller has uncovered Crooked Trump's crookedness.